South of Hell (WE) Rated TV-NR | What to Watch. Maria Abascal is a demon hunter for hire. Her secret power exists in the fact that she herself is possessed by a demon. Starring Mena Suvari, Zachary Booth, Lamman Rucker, Paulina Singer, Drew Moerlein, Bill Irwin, Dana Foxworth. Although the premise of this show is intriguing and the show itself is captivating, the problem lies in how cheaply it was produced and how mediocre the overall effect is. Even the actors, as good as they are, don’t give great performances. I discovered this show because WETV aired the first seven episodes in one night, with the eighth available through iTunes. Although it showed promise at the outset, it ultimately came off as old and mediocre. This show is a pass. 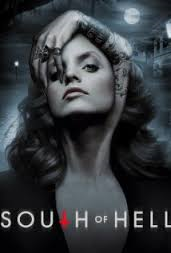 This entry was posted in 2015, Drama, fantasy, horror, Rated TV-NR, reviews, Thrillers, Tv shows, WE and tagged 7, actors, Bill Irwin, Dana Foxworth, demon, Drew Moerlein, eighth, episodes, hire, hunter, interest, itunes, Lamman Rucker, Mena Suvari, night, not worth, one, Paulina Singer, performances, power, premise, secret, South of Hell, trailer, TV series, Tv shows, WE, We TV, Zachary Booth. Bookmark the permalink.